Denise Hart, of Hartford, Connecticut, disappeared in Vermont eight months ago. Authorities searching for a Hartford mother who vanished in Vermont eight months ago scoured land and water Tuesday, collecting evidence along a miles-long stretch of riverbank. 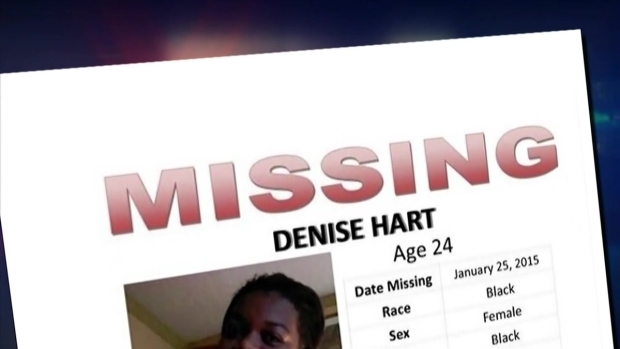 Denise Hart, 24, was last seen the night of Jan. 25 when she left a friend's home in Sudbury, Vermont. Police said they suspect foul play in her disappearance. Hart, who has a 4-year-old son, was reported to have driven away in a 2001 Silver Pontiac Grand Am that she’d borrowed from an acquaintance. The car was found engulfed in flames early the next morning in Cornwall, according to Vermont State Police. Hart's mother reported her missing Jan. 31. Eight months later, the search continues. Twenty law enforcement officials and state agents – including members of the Vermont State Police Scuba Team, Marine Division, Search and Rescue Division, K-9 units and the Vermont Fish and Wildlife Department – scanned an expanse of Otter Creek and its riverbanks Tuesday. Vermont State Police said investigators collected evidence to analyze, but declined to comment on what they found or where they found it. Police said the search area is significant because it includes the spot where Hart's car was found. "The significance of this area is based on information gained in the investigation thus far. Denise Hart had daily contact with her family, who have not heard from her since her disappearance. Foul play is suspected in Denise Hart’s disappearance," Vermont State Police spokesman Scott Waterman wrote in a news release Tuesday afternoon. Vermont State Police continue to investigate and ask anyone with information to call Det. Sgt. Julie Scribner at 802-388-4919.